Each October marks Manufacturing Month. This year, it’s important to celebrate the significant growth the U.S. manufacturing industry has experienced over the past decade, which has created jobs, spurred innovation and strengthened our economy. It’s also important to underscore that a stable supply of minerals and metals is critical to continued growth in this sector. Minerals and metals mining is more important to our manufacturing industry than ever before. 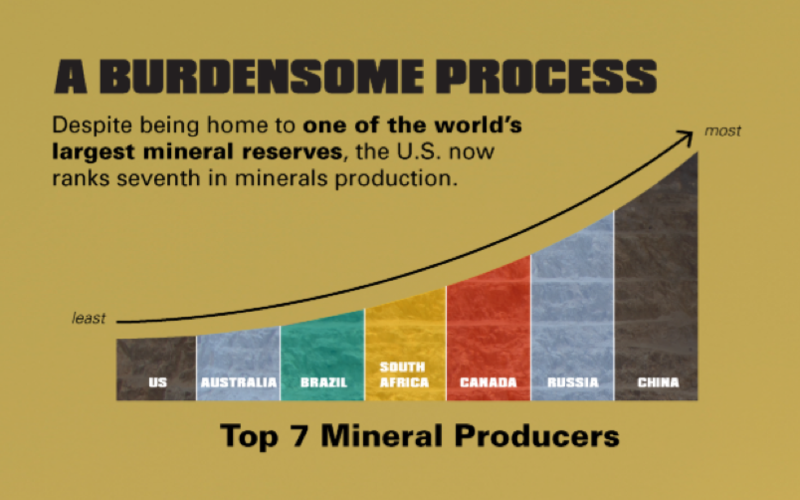 From our cell phones to our cars, minerals can be found in just about every manufactured good. Copper, for example, has properties that are essential to manufacturing – high flexibility, conformity, thermal and electrical conductivity, and resistance to corrosion. Platinum is used in more than 20 percent of all manufactured goods. These are just two examples in the long list of minerals critical to manufacturing. According to research from Deloitte Touche Tohmatsu and the U.S. Council on Competitiveness, the U.S. is projected to overtake China as the world’s most competitive manufacturing nation by 2020. But to see this prediction come to life, there must be a revamped effort to support domestic minerals mining. A stable supply of minerals and metals is a growing concern for U.S. manufacturers, with one study finding that more than 90 percent of executives are concerned about supply chain disruptions. Manufacturing executives also acknowledge the economic impact of domestically-sourced materials, with nearly 85 percent stating that they believe a strong domestic supply of minerals and metals will ensure job creation. In order to support our manufacturing sector and our economy, Congress must act to shorten the mine permitting process. Currently, it can take up to a decade to obtain a mine permit in the U.S. In Canada, a country with similar environmental standards, it can take as little as two years. Timely access to mineral deposits right here at home is essential to manufacturing the products and technologies that make the U.S. a leader in innovation. It’s time to ensure that our manufacturing sector can live up to its fullest potential. To understand the full extent of our nation’s supply chain vulnerability, check out our latest infographic.